Busy holiday season underway at LPIA! It’s beginning to look and feel a lot like Christmas with officials reporting strong passenger numbers at Lynden Pindling International Airport (LPIA). Historically, the peak travel seasonal spans from mid-December through January 2nd. Over the next few weeks, LPIA anticipates a significant increase in user traffic. Last year, during the same two-week period, the airport processed 104,000-plus passengers through its three terminals. Jan Knowles, Vice President of Marketing & Communications at Nassau Airport Development Company (NAD), outlined LPIA’s plans to manage passenger flow at the facility and offered helpful tips to travellers utilizing the airport between now and the New Year. As part of the airport’s preparation for increased traffic, LPIA stakeholders have allocated the necessary resources to enhance passenger movement through the terminals. Existing technology tools including Automated Passport Control (APC) kiosks in US Customs and Electronic Boarding Pass (EBP) for mobile device check-ins are allowing for a smoother travel experience for LPIA passengers. NAD has also partnered with the Bahamas Ministry of Tourism and the Nassau Paradise Island Promotion Board to bring in terminal cheer. Over the next two weeks passengers just may see Santa handing out candy canes in the baggage claim area or hear the sounds of local youth bands belting out carols in the departure lounges. 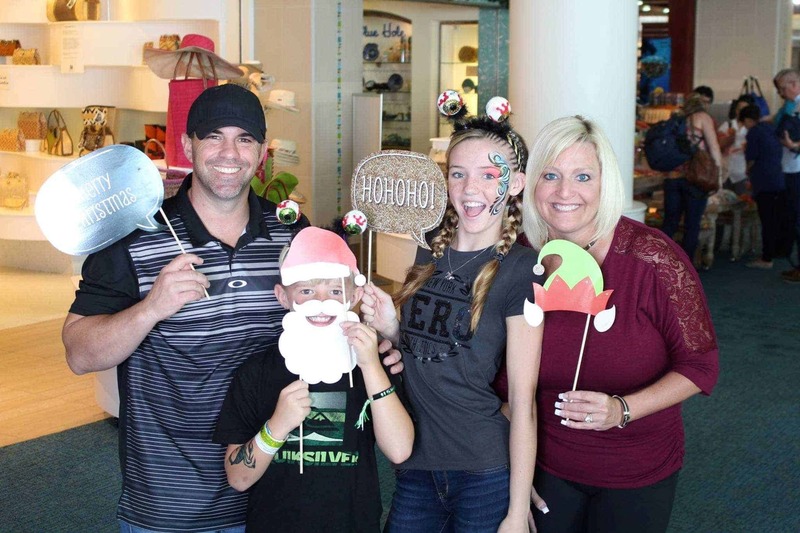 Other activities in the airport’s entertainment program include face-painting, live entertainment, caricaturists, in terminal games and retail deals and discounts. Double check your itinerary- Prior to arriving at the airport, reconfirm reservations and travel times. Also familiarize yourself with your airline’s specific baggage policy and determine your carrier’s onboard services. Ensure Sufficient Time- Arrive at the airport in ample time to check-in and clear security. Remember, check-in at least three (3) hours early for US-bound flights and two (2) hours early for International departure flights. The extra time will give you a chance to shop, dine, relax and enjoy airport amenities and festive treats. Use Tech Tips-Take advantage of options to check-in online and use mobile boarding passes. Prior to arriving at the airport, download all relevant apps and electronic travel documents to ensure a smooth transition. Timing is Everything- Where possible, select travel times outside of the peak departure period. Opt for early morning flights or travel in the evenings to avoid the larger crowds and longer lines. Be Proactive When Packing- Avoid the frustration by being prepared and packing wisely. Restrictions still apply for liquids, aerosols and gels so remember the 3-1-1 rule: 3.4 ounces or less per container for liquids, gels or aerosols; packed in 1 quart-sized clear plastic zip-top bag; limit of 1 bag per passenger. ID? Check. Be sure to bring the right ID for your trip, or you won’t be going far! This includes a valid passport and for local travelers heading to the US, a visa or a police record issued within the last six months. Screen Smart—Take advantage of the wait in security lines by placing coins, keys and any small metal items in the screening bin, removing jackets and outerwear and unpacking your laptop from its bag. Leave gifts unwrapped. They may be opened for inspection as part of the baggage screening process and be sure to wear comfortable clothing and shoes that can be easily removed. Plug In—Stay connected to your individual airlines for specific flight details and to the airport’s website www.nassaulpia.com for updates on flight schedules and information on parking, in terminal services or new security regulations and procedures. Follow LPIA on social media at www.facebook.com/NassauAirport and on Twitter and Instagram @nassau_airport. Enjoy The Extra Time In Terminal- Explore LPIA’s terminals. Enjoy the local artwork. Relax and rejuvenate in one of two travel lounges at LPIA. Log on to the free WiFi and catch up on email or shop for that last minute Christmas gift before heading back home.